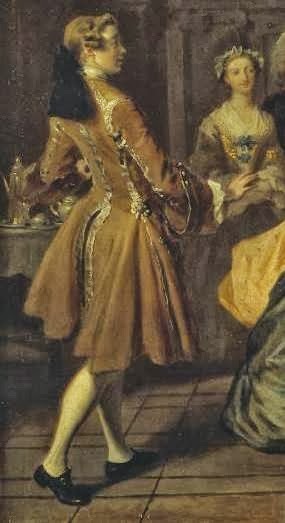 Eventually, after recounting the events of the last painting in great detail to Mr. B, the two go home and fail to confront Lady Davers due to Pamela's avoidant behavior. But they do finally converse, and Mr. B makes it clear that he is truly married to Pamela and that he doesn't feel he's done anything to shame his family. They reconcile somewhat, but Lady Davers still makes a fuss over eating with Pamela. 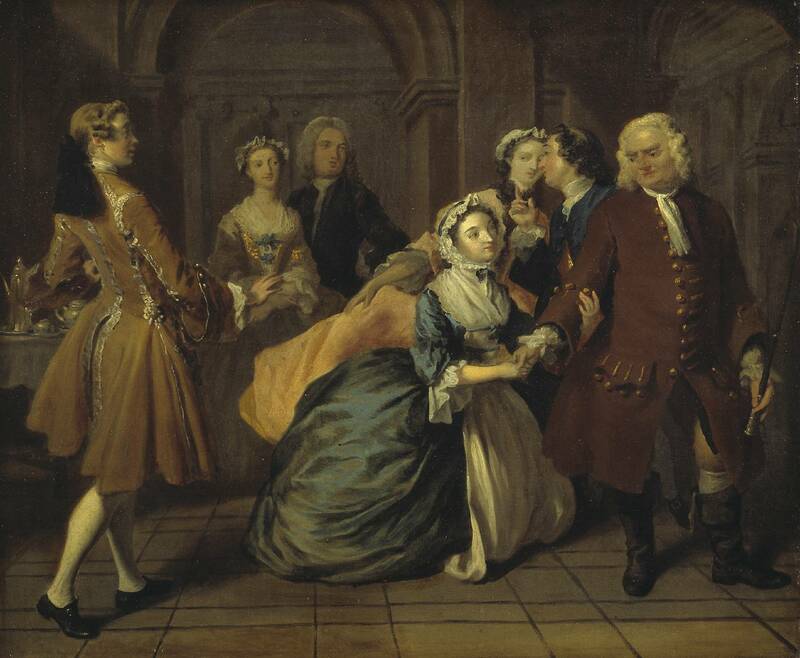 After eating the scene shifts to the garden, where Mr. B explains his part in a duel where the other man died (but not because of his actions) and his past with a Sally Godfrey (a sexual conquest), and Lady Davers finally gives in to Pamela's goodness. Here's an interesting tidbit of everyday life for writers: when they eat dinner - the midday meal in this context - they're described as calling for "the cloth" to be laid in the parlor. And I note that while Lady Davers calls her maid "Beck" when she is an antagonist, once she is nicer to Pamela she calls her the more respectful "Mrs. Worden". Mr. B then embarks on a tangent about why the upper classes grow up to be haughty and have bad tempers, and gives Pamela a description what conduct he expects from his wife, which she turns into a numbered list of forty-eight(!) items. Which is interesting if only as a look at the historical context. The neighbors come around and everyone celebrates. 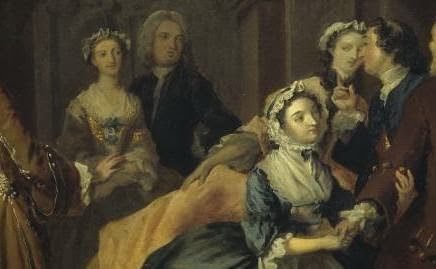 Pamela distributes money to the servants, including five guineas to Mrs. Worden "for a pair of gloves", and the two leave for their primary estate. Once there, they speak with and accept the congratulations of all of the servants in turn, especially the ones that were originally dismissed for taking Pamela's side against their employer. Mr. B then gives her "possession of my lady's dressing room and cabinet, and her fine repeating-watch and equipage; and, in short, of a complete set of diamonds, that were his good mother's; as also of the two pair of diamond earrings, the two diamond rings, and diamond necklace, he mentioned in his naughty articles ..."
Pamela really gets into the tide of fashion at her husband's request. She also has a servant buy "good linen" and suits of "the finest cloth" for her father and of "creditable silk" for her mother to wear at their new Kentish farm. The myth that Victoria invented or popularized the white wedding dress has irritated me for a long while, and so I'm somewhat gratified to find such a strong connection between white gowns and brides in Pamela - she wears white satin to her own wedding, and then continues to wear white afterwards. A group of rakes pays them a visit, and then a group of schoolgirls. 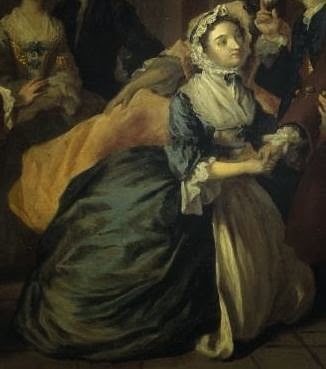 One of the schoolgirls, a Miss Goodwin, is actually the natural daughter of Mr. B and Sally Godfrey, but is considered to be his niece by everyone else for the sake of propriety. After Sally gave birth, she went to Jamaica with some money from Mr. B and married well. On Sunday, the two go to church. The story ends with Pamela achieving success and friendship among the families near Mr. B's home (and an epilogue the tells the reader exactly what they should learn from the examples of each character). However. The story does go on in another volume, which consists of Pamela's letters to Lady Davers and other friends, but which is not included in my copy. From looking at copies of the fourth volume on Google Books, I can see that Sir Jacob Swinford is Mr. B's "uncle by the half blood" who is contemptuous towards Pamela for her background - he calls her "Linsey-Woolsey" - and because his son would have been Mr. B's heir if Mr. B had no children. Lady Davers introduces Pamela to him as "Lady Jenny", the unmarried daughter of a local countess, and he is very taken with her. (There's some banter about the size of her hoop being only suitable for married women.) When they reveal the truth, Pamela kneels to him and he accepts her as his niece. While the actual text would imply that Pamela is meant to be dressed as befitting her station, Highmore chose to dress her down a bit, to emphasize that she is humble and from a working-class background. Her dark blue silk mantua has large cuffs, and fastens with ribbons in the front over a large kerchief. Her cap is the more enveloping sort she wore in earlier episodes, before she was married, and it is accessorized with a blue ribbon. 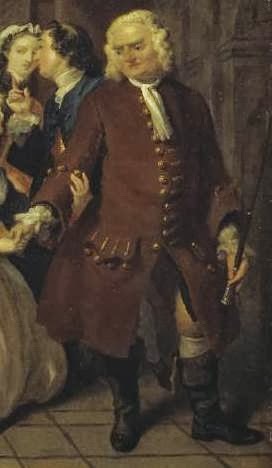 Sir Jacob is dressed as the text describes him, in an old-fashioned coat, which completely covers his waistcoat and breeches. His wig and his narrow cravat, tied loosely around his neck over his coat, are also unfashionable. He is carrying a cane with a silver top. I believe this is Mr. B. His coat is a brown - probably wool - cloth, heavily "laced" with silver. His hair or wig is lightly powdered, and the queue is encased in a black silk bag. The figures in the background are difficult to make out in much detail. One of the women is in a beige mantua, possibly decorated with gold lace, which ties, like Pamela's, over a kerchief with blue ribbons. The other woman is in pink silk, with some sort of dark tippet around her neck. Both women wear smaller caps. One of the men wears a black coat and a longer wig; he may be a clergyman. The other wears a blue coat and completely unpowdered hair.